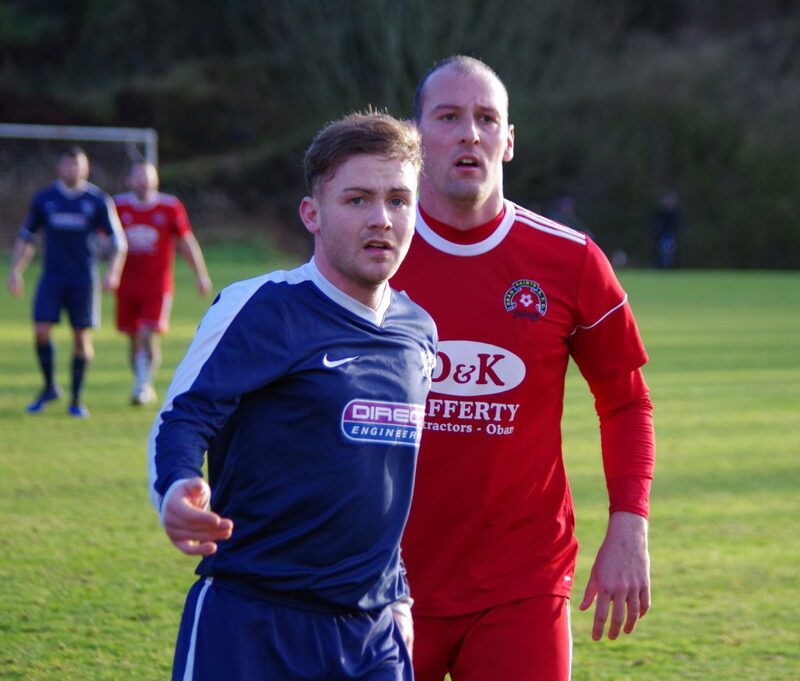 Oban Saints bounced back from the disappointment of their Scottish Amateur Cup penalty shoot-out exit with an excellent West of Scotland Cup win over former Scottish Amateur Football League rivals Thorn Athletic at Glencruitten last Saturday. 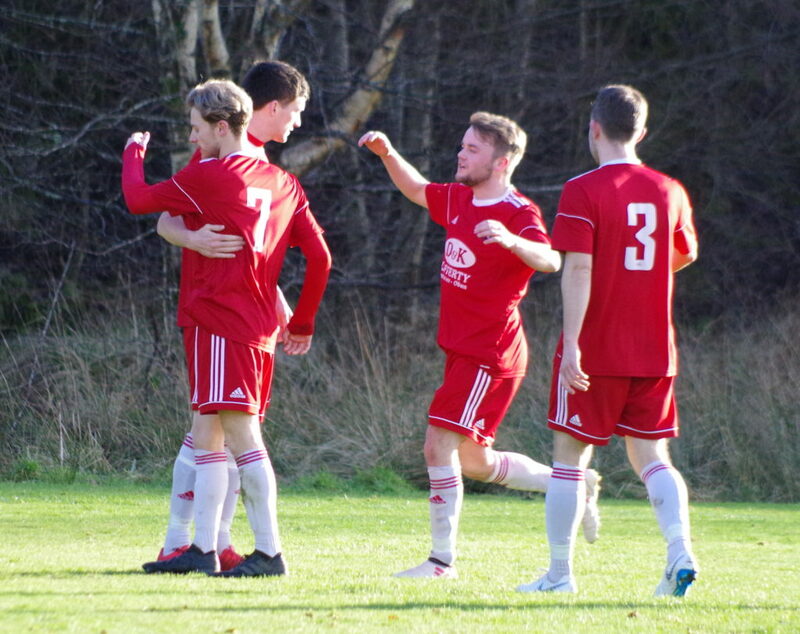 The Johnstone men sit proudly on top of the Caledonian League Premier Division, one of the top amateur leagues in the country, and looked set to provide Saints with arguably their biggest test of the season so far. 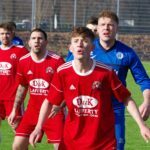 Already out of the Scottish Amateur Cup, the West of Scotland Cup remained the only chance of bagging one of the major trophies for both sides who provided another highly entertaining spectacle for the Glencruitten faithful. With hard frost forecast, Saints had Mossfield booked as a back-up. However, there was no need to put the contingency plan into effect as Glencruitten was once again in excellent condition and a credit to the Argyll and Bute Council grounds staff. Saints management duo Donald Campbell and Willie Gemmell made two changes to the side knocked out of the Scottish Amateur Cup by Rothie Rovers, bringing in Jamie Graham to replace Ruaridh Horne at right back and Kerr Newbigging in midfield for the injured Daniel Croarkin. Saints lined up with Graham Douglas in goal behind a back four of Jamie Graham, Steven MacLeod, captain Dene Cassells and Scott Maitland. Kerr Newbigging partnered Willie Gemmell in the holding midfield roles with Matthew Kelly just behind a front three of Craig MacEwan, Donald Campbell and Lewis Cameron. Saints kicked off attacking the railway end and, after some early sparring, conjured a good opening on the left for Lewis Cameron after some neat interplay between Donald Campbell and Scott Maitland. Cameron burst into box, however, Thorn captain and Scottish Amateur internationalist Ryan Craw-ford made a perfectly timed sliding interception to deny the Saints wide man a shot at goal. Graham Douglas in the Saints goal was pressed into action in the 15th minute making a comfortable save from a Jordan Devine header after Stuart McCann had helped on a Ross Horne throw-in from the left. The visitors were enjoying a good spell with danger man Devine following up his earlier header with a shot from 28 yards which flew high over the Saints crossbar. 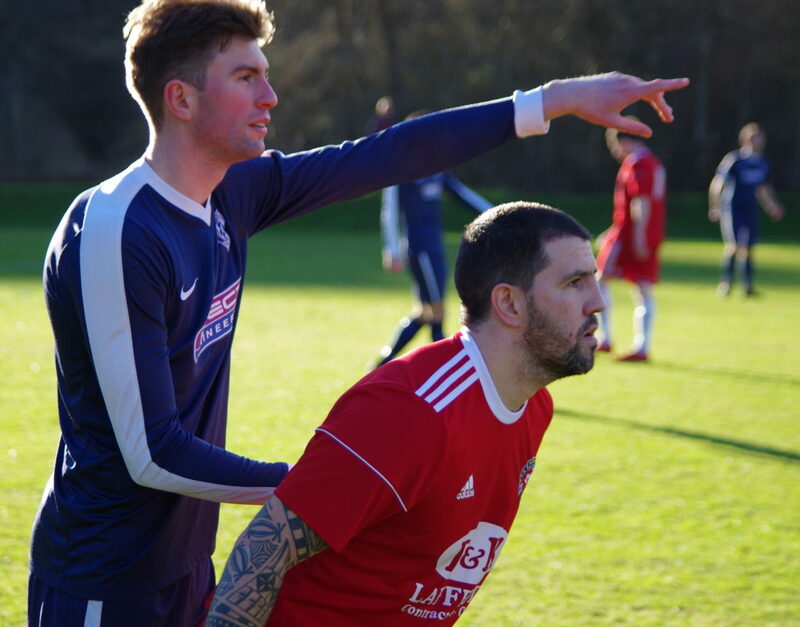 The deadlock was broken in the 19th minute when Lewis Cameron tricked his way past Ian Paterson on the corner of the Thorn box and picked out Craig MacEwan in the middle whose cushioned volley into the bottom corner left keeper Liam McWilliams rooted to the spot. Matthew Kelly doubled Saints’ lead just three minutes later, slotting home from close range after a neat one-two with Craig MacEwan had opened up the Thorn defence once again. Kerr Newbigging, who impressed in the middle of the park in his first start for eight weeks, received a talking to from referee Michael Kerr in the 29th minute for a heavy challenge on Jamie White on the edge of the centre circle. The Thorn sideline and their large travelling support was becoming more vocal, too much so for Mr Kerr who felt the need to calm things down with a word or two for substitute Paul Young on the half-hour mark. Thorn right winger Stuart McCann halted a quick Saints counter attack with a trip on Lewis Cameron after 32 minutes which Central Scottish Amateur Football League referee Kerr, who had an excellent game, was content just to punish with a free-kick keeping his cards safely in his pocket. 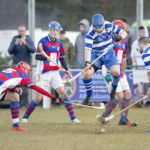 The Saints defence kept the potent Thorn attack, which had run in 30 goals in the previous three rounds, well marshalled with captain Dene Cassells in particularly impressive form. There was, however, one scare just before the end of the first half which Saints had dominated for the most part when a suspiciously offside looking Jordan Devine raced through on goal but sent his low shot wide of the right-hand post of Saints keeper Graham Douglas. The visitors made a change for the start of the second half bringing on Connar McGregor to replace Stuart McCann on the right wing. A neat turn and shot over the crossbar from the edge of the Saints box from left winger Tom Smith proved to be his last involvement as he made way for Dean Scott, one of just a handful of survivors from Thorn’s last visit to Oban almost four years ago. The visitors continued their determined start to the second half without seriously testing the Saints back four which were well protected by holding midfielders Willie Gemmell and Kerr Newbigging. Thorn eventually managed to get the ball into the Saints box in the 56th minute, however, Graham Douglas was able to punch Connar McGregor’s right wing cross clear under pressure from Jordan Devine. Saints made their first change in the 65th minute giving Lewis Cameron a well deserved breather and replacing him with James Ford. It only took five minutes for Ford to make his mark on proceedings with the third goal which Saints needed to make the tie safe. Jamie Graham made a terrific interception on the half-way line and played the ball up to Craig MacEwan. Saints’ top goalscorer in each of the past two seasons advanced to the edge of the box and laid the ball off to the overlapping Jamie Graham who picked out James Ford with an inch-perfect cutback which Ford clipped into the net past the right hand of Liam McWilliams. Thorn threw on Paul Young and Darren Lamont for the final 20 minutes at the expense of Jamie White and Ross Horne. The change gave the visitors fresh impetus and they came close to opening their account when Jordan Devine lifted a Dean Scott cross over the Saints crossbar. Donald Campbell made way for David Beaton in the 73rd minute just before a tame Dean Scott shot from the edge of the Saints box was easily saved by Graham Douglas. Matthew Kelly was penalised for a late challenge in the 75th minute which gave Thorn deadball expert Paul Young the chance to influence proceedings. Thorn’s free-kicks up to that point had been easily dealt with, however Young’s accuracy immediately put the Saints defence under more pressure with Willie Gemmell having to head the veteran left footer’s delivery behind for a corner kick. 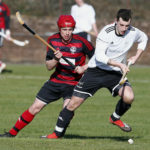 The visitors were at last showing glimpses of the form which has lifted them to the summit of the Caledonian League Premier Division with Jordan Devine again making a nuisance of himself and pressurising Jamie Graham into a mis-hit clearance which bounced back off the right-hand upright before Dene Cassells thumped clear. Dean Scott whipped a dangerous 77th minute corner kick from the right across the six-yard box where striker Jordan Devine sent a stooping header narrowly wide of target. Matthew Kelly made way for Fraser MacFarlane in Saints’ final change in the 78th minute. Thorn found the net three times from corner kicks on their last visit to Glencruitten and set pieces again looked to be their most likely route to goal. Playmaker Dylan Blair found the head of Darren Lamont with a corner kick from the left which the big defender sent well wide of target after a Dean Scott shot across the face of goal had been deflected behind. As the Saints defence and midfield sat deeper to protect their highly prized clean sheet, the influential Dylan Blair was able to get on the ball more and set up Connar McGregor for a chip over the Saints crossbar in the 87th minute. Thorn were rewarded for their perseverance with a deserved, albeit fortuitous, 89th minute consolation goal. Dylan Blair was once again heavily involved, providing the pass for Jordan Devine’s 25-yard shot which looped up off the right thigh of Steven MacLeod and beyond the stranded Graham Douglas. Dean Scott had the final opportunity of the afternoon in the third of the four additional minutes allowed by referee Michael Kerr. After finally managing to get behind the Saints defence, the Thorn wide man was thwarted by an excellent save low down to his right by Saints number one Graham Douglas. Mr Kerr’s final whistle brought to an end another exciting encounter between the two old rivals, with Saints by far the more satisfied to go safely into the hat for Tuesday evening’s fifth round draw and a place in the last 16 of the competition. 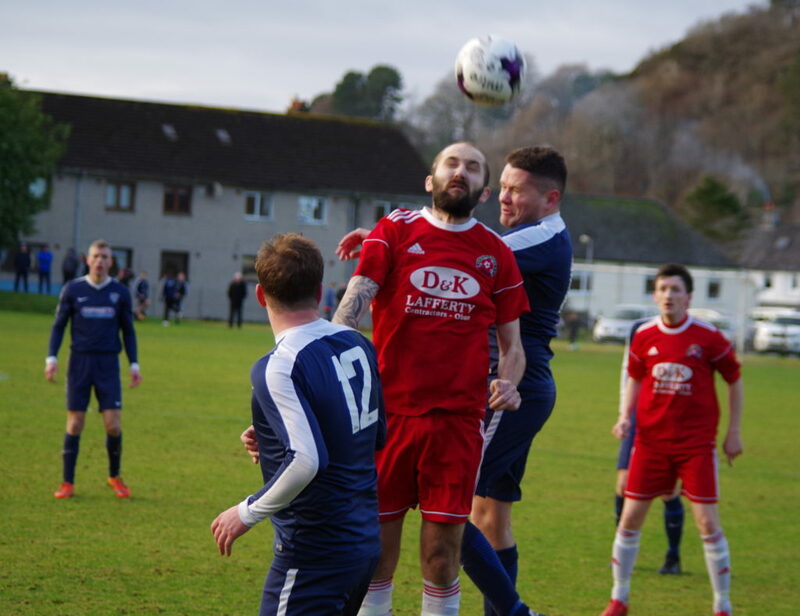 Saints remain on cup duty this coming Saturday when they travel down the A816 to face Lochgilphead Red Star in the first round of the Scottish Amateur Football League Jimmy Marshall Trophy. Kick-off at the Ropework is 2pm.